I found myself remarking to a colleague and friend the other day that “I am absolutely overwhelmed at the moment. There is just flat-out too much to do. I can’t even find time to think.” My friend graciously tried to find those things I could just “let go.” Not an easy task, but necessary at certain times in our lives, as we all know. At just this same time I happened to run into some remarkable reading about solitude. I was struck again with the notion that we all need solitude. I was struck with how hard it is to find time for solitude. In solitude we rediscover our balance. In genuine solitude we are renewed, rested, restored. In solitude we find the deep value of doing nothing sometimes, something similar to the restorative powers of real sleep. We discover we rest in the lap of something so much bigger than ourselves, bigger than our forced activity, bigger than our need to make the world a better place. 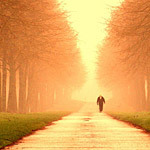 In solitude we discover again God’s gift of grace, that life is a gift, that we have made very little by our own will. In solitude we discover gratitude and humility. Part of the reading I ran into on this topic is the Gospel of Matthew. At SPU we are all making our way through Matthew this winter under the able guidance of Dr. David Nienhuis. His weekly teaching can be found online on our Lectio. In any case, I was assigned to preach last week in our chapel series on Matthew 14. I focused on two amazing stories: the beheading of John the Baptist and the feeding of the five thousand. What a jolting juxtaposition when these two stories are brought together. But something leapt off the page for me in between the two stories. After John the Baptist’s head is severed and served up on a platter, the story simply ends by noting that John’s disciples “went and told Jesus.” And what does Jesus do with this stunning, devastating news, news that is fraught with such ominous foreshadowing of his own future, news that speaks of a brutal, unjust world, news that is in such utter conflict with the kingdom of heaven? This is what we find: “When he heard what had happened, Jesus withdrew privately by boat to a remote place.” Jesus withdrew into solitude. What we find throughout Matthew is that this is an essential pattern of our Lord. He knew he needed solitude. He withdraws to pray, to collect himself, to read and study the Scriptures, to renew and rest and realign himself with the will of his Father. How does one lead when such dark forces are swirling all around? How does one live when the pressures are intense and overwhelming? How does one do the work of God’s kingdom when the kingdom of our world rules the day? Well, it has something to do with solitude. Jesus needs solitude. He withdraws privately to a remote place. And we need to find our remote places as well. Do we give ourselves enough time for solitude? For reading and reflecting and renewing? For doing nothing? For regrouping, rebalancing? The answer is emphatically “no.” Not for me, I confess. And I don’t see many models out there from which to learn the discipline of solitude. Maybe Jesus is that model. Maybe these little interludes in the book of Matthew tell us something profound about how to live, how to lead, that in fact we desperately need these moments of solitude. Stay tuned, I have a few more thoughts on solitude I would like to share in my next post. Thanks Philip, this morning I felt guilty for being up at four in the morning. I felt that I was stressing over my three colleagues being away and having to hold the fort so to speak until they get back. Your article helped me to turn it around and appreciate the stillness of the morning and realise the reason I have come here is to drink from the well of solitude, and allowed me to refresh. thanks. Thank you for a very timely reminder. I too am in overload and my default is to just work harder. Solitude is what I need and is the place where I can experience God’s renewal. My personal recommendation for solitude: Christ in the Desert Monastery (www.christinthedesert.org) in Abiquiu, NM. The last time I was there, two of teh guests were protestant clergy who take annual or biannual vacations there. You keep the grand silence, and can spend a good bit of time just hanging out watching the light change in their incredible canyon, while gently being immersed in scripture.